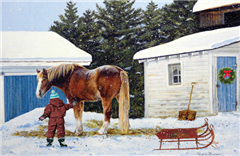 This Holiday Greeting Card has a classic farm image of a boy and his horse. Beautifully painted by artist, D.R. Laird this Christmas Card is bound to be an instant classic. Receiving this card is bound to get a positive reaction from you business associates.